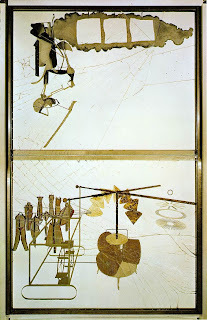 "The Large Glass" was a work by Marcel Duchamp. He executed the work on two panes of glass using materials such as lead foil, fuse wire, and dust. It combines chance procedures, perspective studies, and laborious craftsmanship. Duchamp made numerous notes and studies, along with preliminary works for the piece. The notes reflect creation of unique rules of physics and myth. In his notes he describes that this "hilarious picture" is intended to depict the erratic encounter between the "Bride" (in the upper panel) and her nine "Bachelors" (gathered below). This is a complex piece that dominates the empty space around it. The glass was once shattered, but reassembled by Duchamp and rests between two pieces of glass, set in a metal frame with a wooden base. The piece consists of many geometric shapes that blend together to create large mechanical objects. The objects seem to almost pop out from the glass.